As laptops are becoming thinner than ever, the ability to connect monitors has become a bigger challenge. 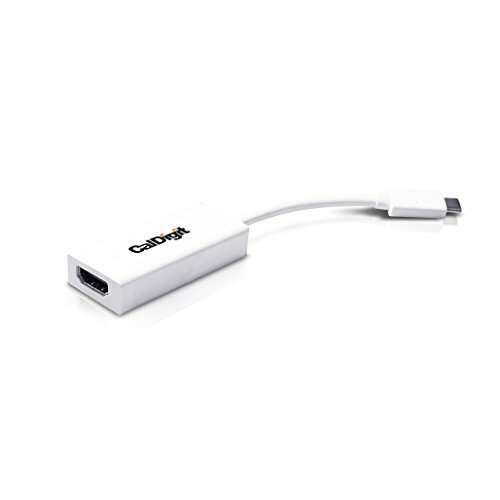 The CalDigit USB-C to HDMI 2.0 adapter solves this problem by providing an easy and affordable way of connecting your computer to a wide variety of HDMI monitors. The CalDigit USB Type C 3.1 to HDMI Adapter is a convenient solution for those looking to add a video output to a USB 3.1 Type C equipped computer. This adapter features high grade components and extensive emissions shielding in order to deliver you the best and consistent video quality. The CalDigit HDMI adapter features a Type-C connector features a reversible design which means that users do not need to find the right side of the cable in order to plug it in. CalDigit's heritage in creating high quality products continues with our USB-C Adapters. Many companies reduce the quality of their adapters in order to drive down the cost. CalDigit believes in providing the best quality products that will stand the test of time. Our USB-C adapters feature 6 layer PCBAs that include a grounding layer which reduces noise and extensive EMI shielding in order to deliver the best video quality. The CalDigit USB-C adapters also support HDCP, USB-C billboard functionality, and meet USB-C specifications.